Ella & Pitr, famous street art duo based in Saint-Etienne, France was in Italy recently, participating in the Urban Area Open Spaces project. The recent piece brings another of their famous gigantic characters just relaxing on a summer day. 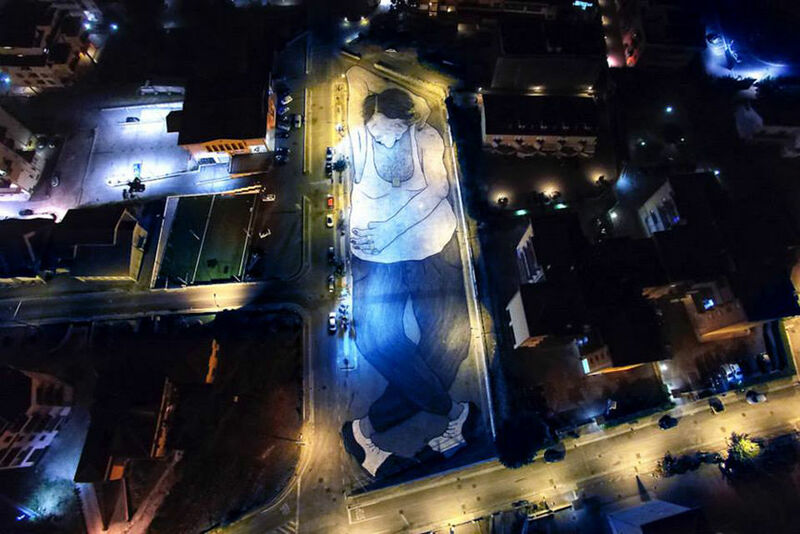 This lazy figure of a man is depicted in the napping position on one of the parking lots in Campania in the province of Salerno, Italy. 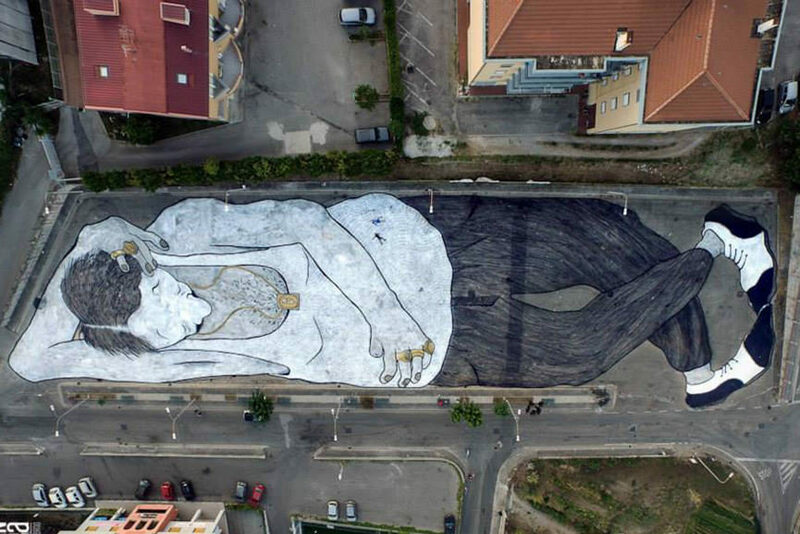 The size of their piece is impressive but is nothing less than we expect from Ella & Pitr duo, recognizable for their oversized artworks created in sometimes unusual places. 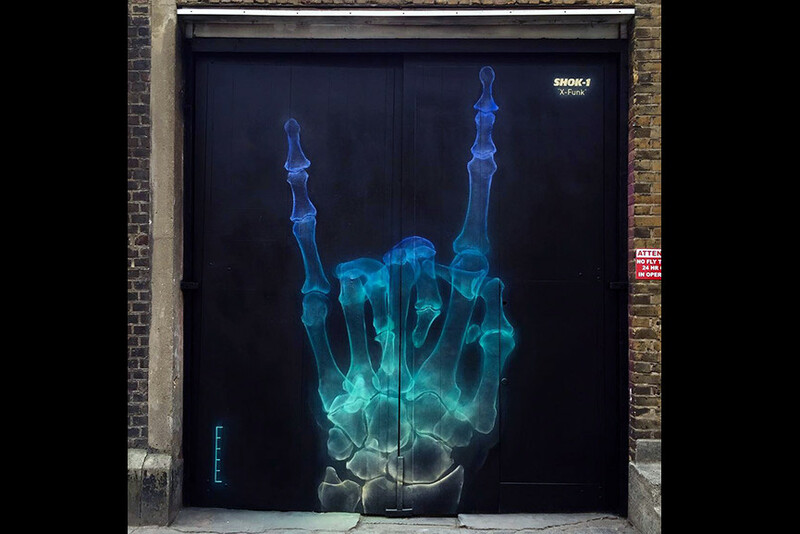 British artist SHOK-1 created one of his signature pieces in the streets of East London near the Brick Lane. The title of the artwork is X-Funk depicting the X-ray hand in the formation of the horn sign. 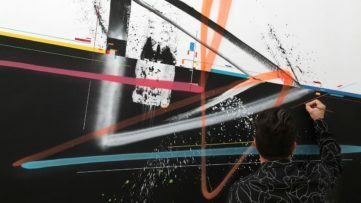 SHOK-1 is famous for his free-hand spray painting technique used for the making of unique X-ray artworks with translucent effects. 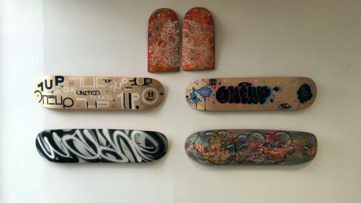 He’s been on the street art scene for over three decades constantly improving and reinventing his anatomy inspired style. And if you thought that a week would pass without reports on the work of JR you are terribly wrong. This French photographer seems to be working in his full capacity, collaborating with others and doing the individual work. 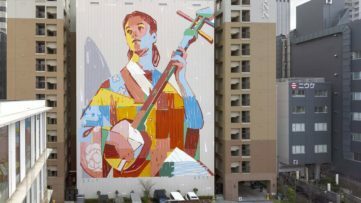 He is just everywhere in the streets of New York and for this recent mural he created a large figure of a famous ballet dancer Lauren Lovette on one of the buildings in the Tribeca neighborhood. 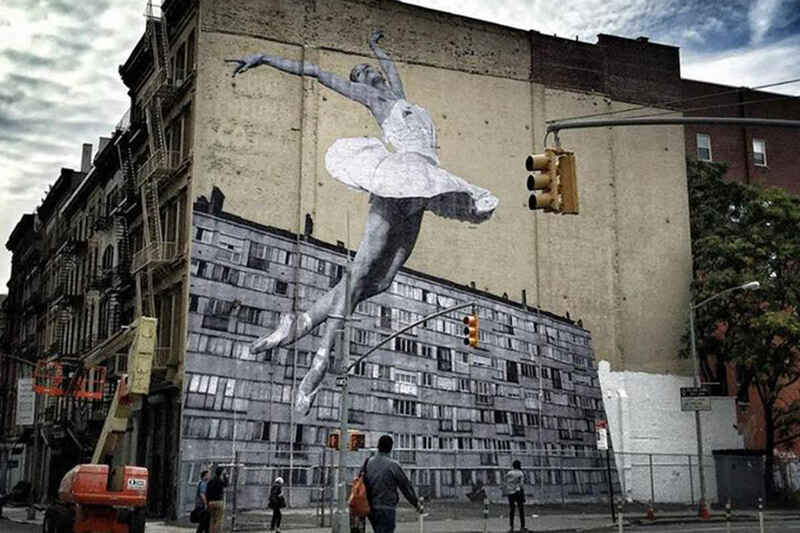 JR’s street artwork resembles the image used for the promotion of his documentary done in the collaboration with the New York City Ballet. 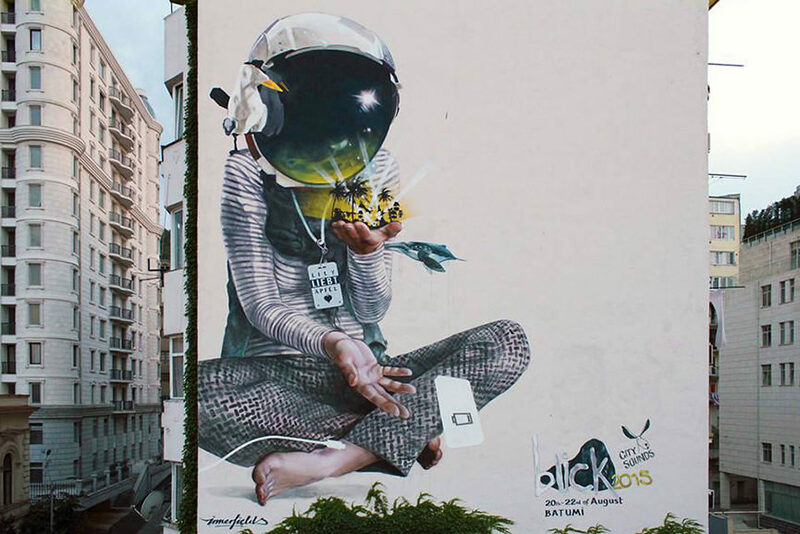 Innerfields artist collective from Berlin, Germany was recently in Georgia awaiting the Blick Festival in Batumi. The festival starts on 22nd of August, and while they are waiting for the festival to begin Innerfields are keeping it busy on the streets of the Georgian capital Tbilisi. Their Lily Loves Apples piece brings out the youthful and innocent imagery often explored in various works by Innerfields collective. After his recent participation in Malta Street Art Festival, WD aka Wild Drawing is back in Athens where he just finished his latest mural. After innocent Disney-inspired character made for the festival he engaged in a more politically motivated work. The Balinese artist currently based in Greece left an inspirational message to the citizens of Athens. While depicting the chained, tired man WD also suggest that the Hope Dies Last, and it is a much needed notion in the community stricken by the economical hardships. 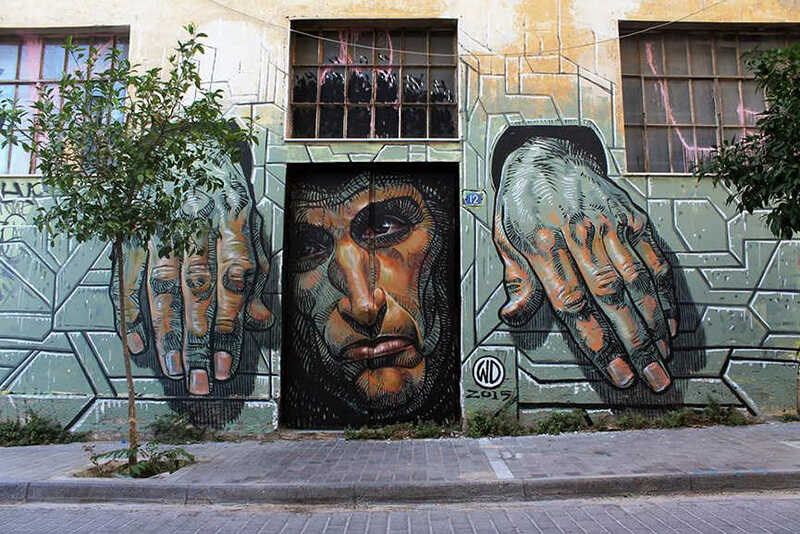 The piece can be found at the back entrance of theater ΕΜΠΡΟΣ, Psiri. Sign up for My Widewalls for FREE and never miss a mural, wherever it is made!